Many sculptures have been found showing the Roman army in operation as well as individual memorial monuments to soldiers. The workmanship on these monuments and indeed the amount of weathering vary considerably but the better known examples such as Trajan&apos;s column may not be the best primary source for the type of helmets used at any given period of the Roman Empire. There is a suspicion amongst several military researchers, such as H. Russell Robinson, that monuments erected in Rome used a formalised Greek style rather than being based on actual equipment currently in use by front-line troops. An alternative suspicion is that when any equipment was shown on monuments in Rome it may have reflected that commonly used by either the Praetorian troops or Urban Cohorts who were based in Rome. Local masons in the provinces around Legion camps may give a more accurate indication of the actual equipment used, as they would have been working with or for people wearing similar equipment to their subject. However, often the quality of carving remaining today is not as good as that in Roman examples, so their utility for historical accuracy has often either been ignored or questioned. In either event even the most realistic of carving may not allow an accurate interpretation to be made of how the average Roman Legionary or Auxiliary would be equipped in full battle array. The primary evidence therefore devolves to a scattering of archaeological finds, which are often damaged or incomplete. Due to the number of individual helmets discovered on Roman sites, even when incomplete, similarities of form and function have become apparent along with an indication of how different helmets were developed over time. H. Russell Robinson worked in the Royal Armouries and in 1975 was the primary researcher who using the available information, from archaeological finds of helmets throughout the Imperial Roman period, classified into broad divisions the various forms that were being found. For infantry he used four classifications for Legionary helmets. These were additionally lettered within each group to show significant variations in date and methods of construction. He also classified approximately 30 different types of check guards, which were in use with these and other varieties of Roman Helmets. His book The Armour of Imperial Rome gives detailed descriptions of his classification system but it is currently apparently out of print and rarely available so consequently is expensive to buy through dealers. 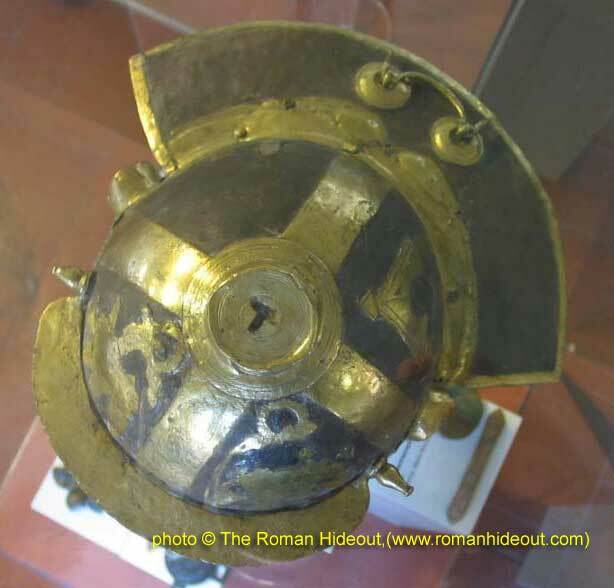 Most of the helmets normally identified as used by legionaries have some form of plume or crest holder on the crown of the helmet but the precise method of attachment varies depending on period, location made and the type of helmet. The earliest forms known were probably similar to those depicted on early Greco-Etruscan pottery. The plumes and crests, based on the styles depicted on the pottery, appear to have used either feathers or naturally coloured horse-hair. 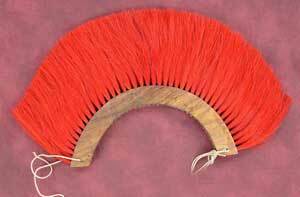 If this style had continued in the Roman period then plumes or crests would normally have been a combination of white, black or red-brown in colour as horse-hair is difficult to dye using only natural vegetable dyes. The earliest form of helmets appear to have only had centrally mounted plumes but in the early Imperial period late 1st BC to early 2nd century AD fittings have been found indicating that removable crest boxes might have been used. The evidence for crest boxes are mainly U-shaped crest holders which could be attached to fixing points in the centre of the crown and at the back of helmets. The lack of other non-metal remains indicates that crest boxes may have mainly been made out of wood so have rotted away over time. There also appear normally to have been either plume or possibly feather holders positioned on either side of the helmets. 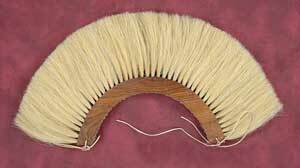 If feathers were used then these might have been goose feathers as sacred to Juno. The purposes of these plumes or crests are thought to have been either for decoration, unit identification or as an indication of rank. Evidence from sculpture and monuments indicate that by the 2nd Century AD the crests were not used during combat and are mainly depicted only in use for parades or festivals. Vegetus is quoted as stating that centurions had a different form of crest and some sculptures of centurions show them with crests mounted transversely across their helmets, while representations of legionaries normally have the crest running from the brows towards the nape of the neck. 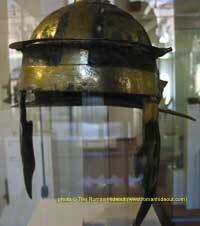 The most common group of helmets was the Imperial-Gallic , based on the type of helmet used by the Gaul's. These were more decorated than earlier varieties with embossed eyebrows , had a re-enforced peak and a ridged extension at the back as a neck-guard. These were initially probably made by Gallic smiths so retained the original influence in construction and design and stretched in use from the late 1st century BC through to the early 2nd century AD. 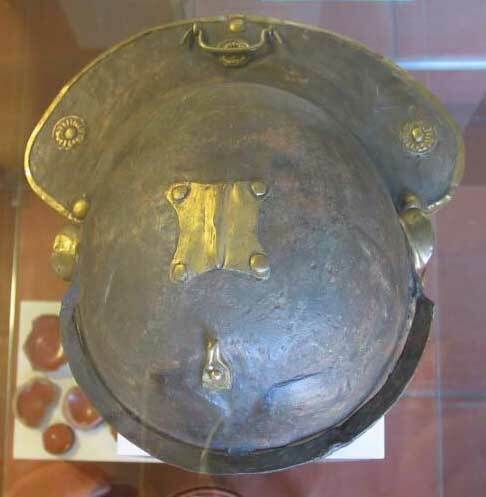 These helmets were mainly made of iron with recesses for the ears and brass decoration including small circular bosses on the helmet and the cheek pieces. The crest holder consisted of a right-angled foot that slid into a tube on the crown of the helmet, although some versions found also have additional decorative plume holders at the ends of the peak. 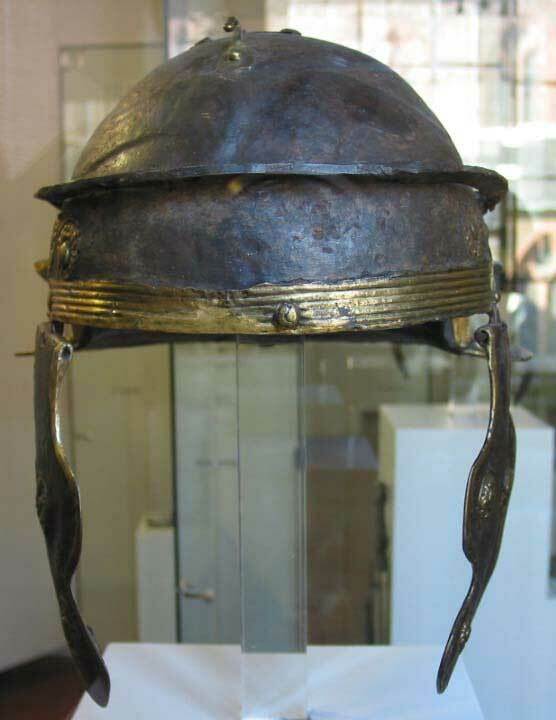 Another major group, were the Imperial-Italic, which were in shape similar to the Imperial-Gallic but because of their simplicity of construction technique and lack of decoration Russell Robinson placed them as being made by Italian smiths and probably based on the Greco-Etruscan and Italian helmets of the Republican period. They were in use from the late 1st BC to early 3rd century AD. Several types used twist on crests that were held in a T-shaped holder on the crown. The earliest known versions of these helmets have no archaeological provenance but are claimed to have been found in Herculanium, so may have been used by the Urban Cohorts or the Praetorians. In his book Russell Robinson has classified various types of helmets not mentioned in this article as primarily being used by auxiliaries, as the patterns of helmets were generally very plain and of simple construction when compared to the legionary helmets. Other versions of helmets including those with representations of faces were classified as normally being used by cavalry. Peter Connolly in Greece and Rome at War , Greenhill Books 1991, 1998 states that; The archaeological evidence for infantry helmets during the 3rd century (AD) is very sparse. When in the succeeding century helmets regularly appear again they are of an entirely different type and are clearly unrelated to the earlier forms. 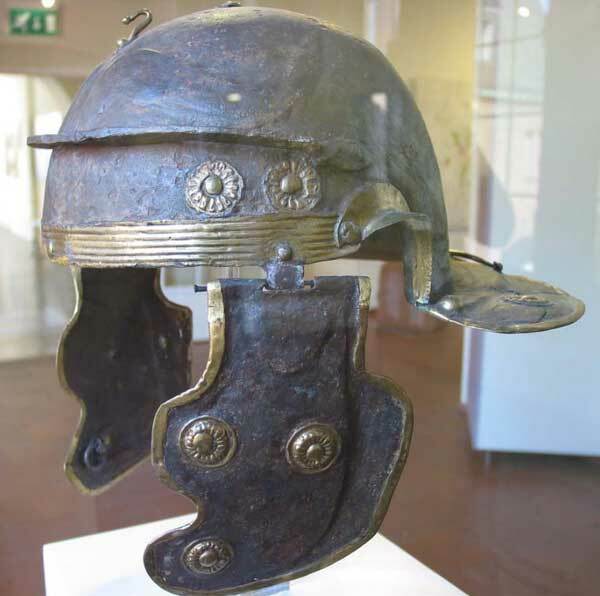 The last type of legionary helmet which retained the original form is Robinson's imperial Italic type H.
Connolly goes on to say that from Roman finds in Hungary the Intercisa type of helmet is a crude iron helmet and may have been introduced by mercenaries (in the 4th century). 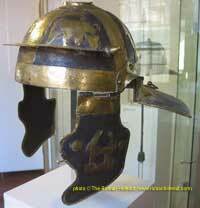 In the 5th century cavalry helmets appear to be related to the early medieval Spangenhelm . 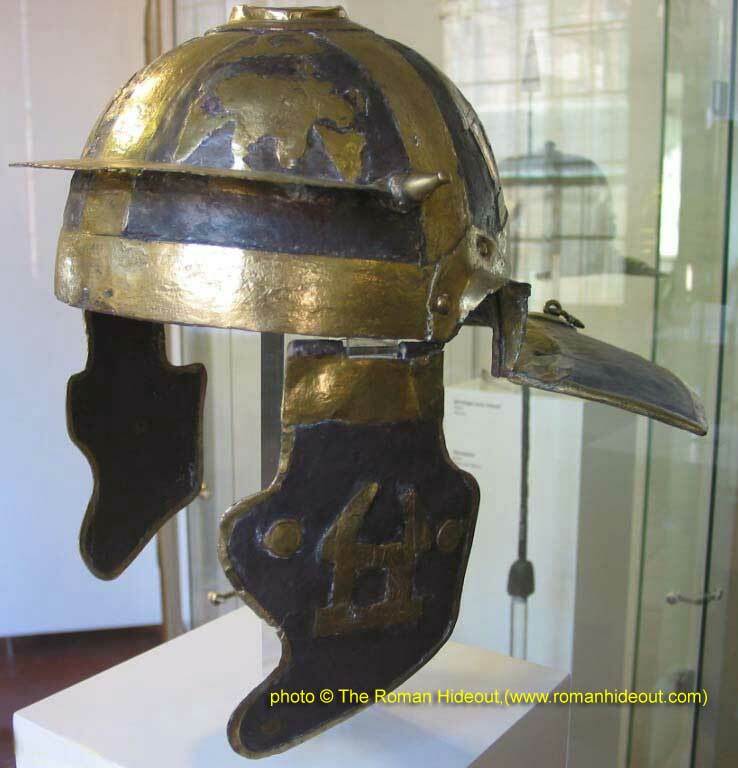 The Spangenhelm type of helmet was possibly also used by infantry in the Byzantine period and is basically 4 triangular metal plates joined together to form the helmet and was used extensively from the dark ages up to at least the 10th century. There is currently only limited evidence for how Roman helmets were padded in normal use. The little evidence that has been found would appear to indicate that some form of thick woollen or possibly quilted linen padding was used but small pieces of leather have also been found with helmets. The leather found would probably have been used primarily as edging rather than as padding itself as leather needs to be kept oiled or it will deteriorate due to perspiration. There is no real evidence that any padding was riveted into the helmets and there would be no need to do this as the Romans had natural glues, which could have been used instead to fix padding into the helmet. A resinous material has been found inside some helmets, which became soft when hot water was applied to it. This would allow damaged sections of the padding or helmet to be easily replaced. An alternative means of padding would be to wear a simple loose woollen or felted "hat" (or, arming cap) inside the helmet. In common with most armies, although helmets were made in slightly different patterns over time it is likely that a new legionary would normally have been issued with whatever type of helmet was available locally, irrespective if it was technically out of date. Only if a helmet deteriorated or was damaged to such an extent that it could no longer be repaired would it have ceased to be issued. This possibility means that the usual image of a legion being totally uniform in appearance is highly unlikely and may explain differences in equipment noted in some paintings and statues that have previously been identified as being because the subjects were representatives of different units or even ranks. One possible reason for the differences noted in later helmet style were the major changes in military production methods initiated by Diocletian in the late 3rd century AD. Military equipment production started to be concentrated in almost "factory-style" specialised production areas throughout the Empire. By the 5th century approximately 44 of these "factories" were listed in the Imperial records. Each individual location would have concentrated on only one or two types of equipment. In a similar way to other equipment, helmets would probably no longer have been made in either their traditional areas or possibly even by the previous armourers. It is entirely possible that along with changes in manufacturers there would be revisions made to how helmets were produced in turn leading to the radical differences and changes already noted in the later helmets. H Russell Robinson The Armour of Imperial Rome, Purnell Book Services, Book Club Edition, 1975 used for references although acknowledgement is made in it to Arms and Armour Press and Lionel Leventhal Ltd.
Peter Connolly Greece and Rome at War, Greenhill Books 1991, 1998.